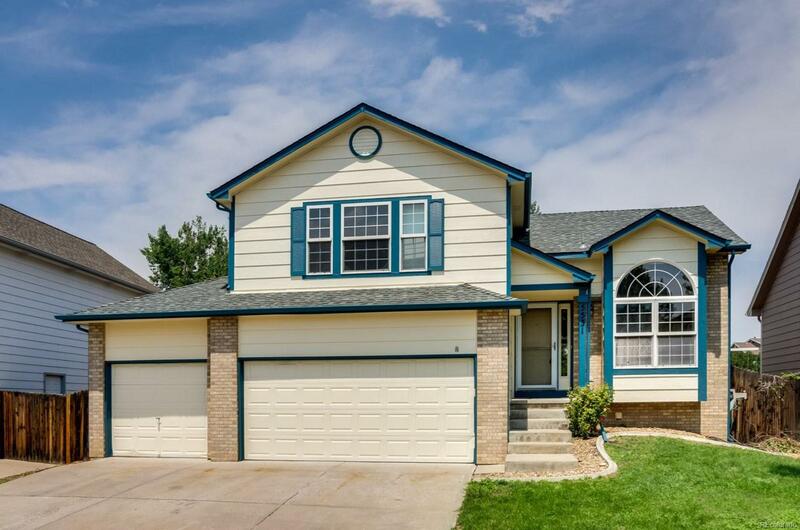 Beautiful 3 Bedroom, 2 bath home in desirable quiet neighborhood! Open entry with vaulted ceilings and hardwood floors leading to the living/dining room combo next to the sunny eat-in kitchen. Steps down youll find the family room where you can spill out onto the deck with a fenced in yard that backs to open space. All bedrooms on the upper level to include the master with its own private bathroom. 3 car garage great for storage, new exterior and interior paint, new carpet and stainless steel appliances. The backyard provides a clean canvas for your landscaping ideas! You'll never have to shovel with a heated driveway! Prime location with easy access to light rail station (Union Station to Thornton is 27 minutes!) and upcoming Trail Winds Rec Center.